[tweetmeme] Is there anything more homey than a big ol’ broccoli casserole? Perhaps it’s a sign of my “settling down”, now that I’m married with two kids and live in the suburbs (when did this happen?) but I’ve rediscovered casseroles in the past year or so. You’ll almost never see one on a restaurant menu but so many of us grew up with them on our dinner tables at home. When that shallow 13 x 9″ dish comes out of the oven, with errant strands of cheese baked onto the sides, I just know I’m in for a treat. 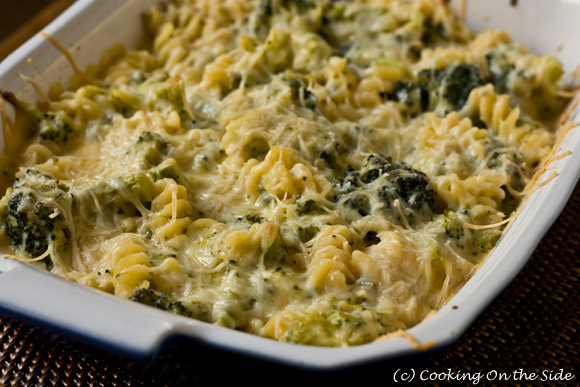 I’d actually describe this casserole as “mac & cheese with broccoli”. Steamed broccoli is tossed with spiral-y fusilli pasta in a creamy cheddar cheese sauce, topped with Parmesan and baked to bubbly deliciousness. I’m pretty sure I found this recipe on the side of a package of broccoli florets, although unfortunately I forgot to save enough of the original package to know for sure. Two good things I do know: 1) it tastes great alongside ham and 2) even a two-year-old will eat it. In a large pot of boiling water add 2 teaspoons salt and one tablespoon olive oil. Add fusilli pasta and cook until al dente. Drain. Cook broccoli in microwave for 6 minutes. Drain any water. In a large saucepan melt butter or margarine; stir in flour and milk and whisk until mixture boils and thickens. Add cheddar cheese, salt, garlic powder, nutmeg and thyme and stir until blended. 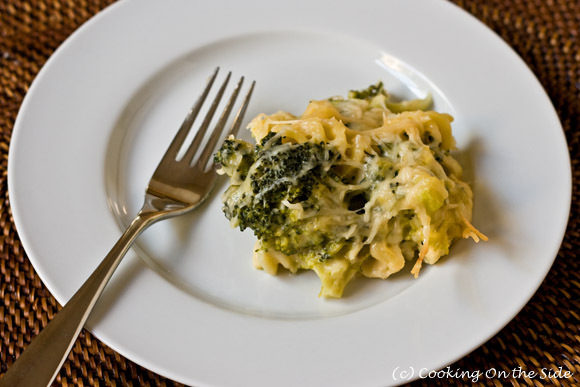 Add cooked broccoli and drained pasta to cheese sauce. Mix well. 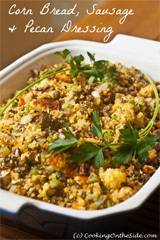 Spoon into a greased 9 x 13-inch baking dish. Cover with shredded Parmesan cheese. Bake uncovered for 20 minutes. Let stand 10 minutes before serving. This sounds so good, I love vegetables with pasta. Funny there can be too much pasta on a plate for me. Thanks, this will be cooked here. .-= Melynda´s last blog ..Monday night brights =-. Would this work with skim milk? It looks perfect for dinner but all I have in the house is skim… am I looking at a trip to the store if I want this? Thanks! Well…I’m always a little reluctant to use nonfat milk in recipes out of fear of losing some of the richness/creaminess. I used 2% and it worked fine – I think it’s probably best to use at least 2% here for a nice creamy-textured cheese sauce. YUM! I always love recipes that use fusilli pasta because the sauce tend to cling to it! This looks delicious! 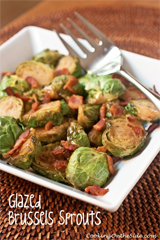 .-= Jennifer´s last blog ..COOKBOOKMANIA! : Lentil Soup with Sausage & Cabbage =-. Thanks, Dani – so glad you like it! I just made this and oh my goodness is it good. Thanks for a such a great recipe! I’m glad you liked it! 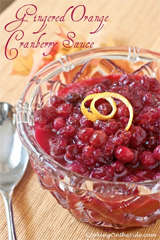 I just made it again myself last week – it’s a great recipe.